From the beginning, an air of mystery surrounded Katy Perry's Super Bowl halftime performance: who will perform with her, besides Lenny Kravitz? Will she sing as many of her biggest hits as humanly possible? Will she shoot whipped cream out of her bra? (I sure hope so.) Just a handful of days before Sunday's big performance (during which, oh, about 115 million viewers will bop along to Perry's set), another piece of the puzzle was uncovered: Late 1990s/early 2000s bubble suit-wearing rapper extraordinaire Missy Elliott would take the stage with Perry. The duo last collaborated on Perry's 2011 hit "Last Friday Night (T.G.I.F)", and a performance like the Super Bowl halftime show turned out to be a watershed moment in Elliott's career, which has been under the radar for about a decade. I, for one, am happy to see Elliott "Work It" on stage once again, and her being picked for Perry's halftime show is certainly a push in the right direction. Timbaland, get on that! 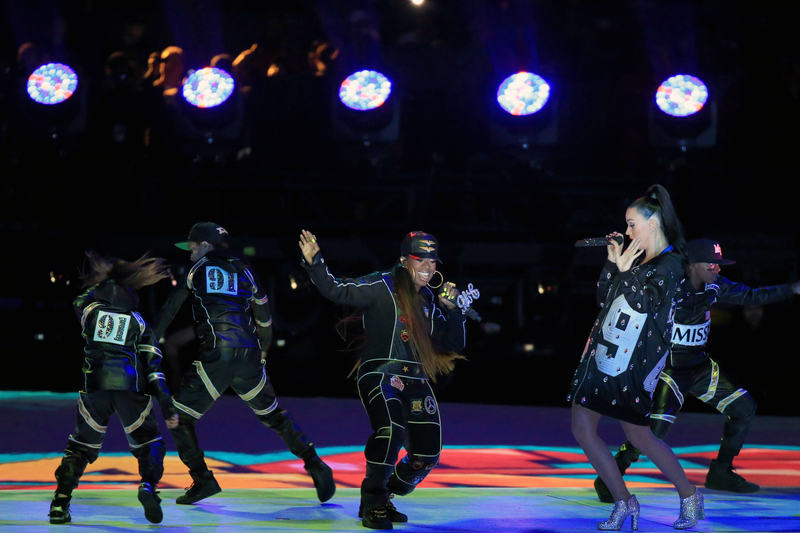 Elliott’s performance was, in a word, iconic — she was the best part of Perry’s halftime show. Elliott opened things up, sporting a racing jumpsuit (I really missed the blow-up bubble suit, though) and a jewel-encrusted mic, with “Get Ya Freak On” totally overwhelming Perry’s trove of cartoon sharks and turning Perry into a hype girl (sorry, KP). “Work It” and “Lose Control” followed, with similarly racing striped dancers (didn’t she always have the best dancers?) killing it alongside Elliott’s smooth rapping (which definitely wasn’t live, but whatever). If that's not a call for Elliott to get out there and do some more music, I don't know what is. We miss you! Missy Elliott for President 2016!